Children and young people who are survivors of domestic abuse (CYP SODA) are getting help from Women’s Aid Orkney too. That’s because we have a team of impartial support workers here just for you. They provide free and confidential support to children and young people. So that means that when they help you they won’t tell anyone about what you say – unless they are worried about your safety. Not even mum and dad. They have lots of toys and games. And if you want you can talk to them about things like feelings, relationships and keeping safe. They are here for you to help make sense of things that have happened at home. 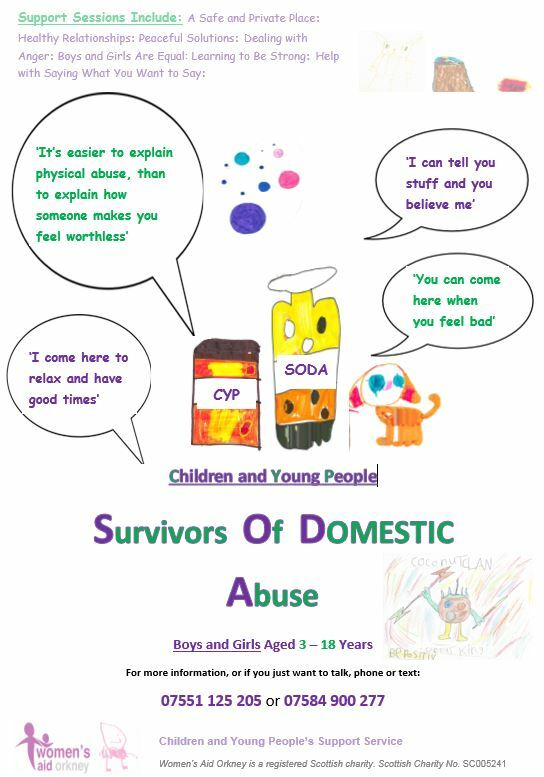 Our Children and Young People made this poster to tell you about how Women’s Aid Orkney can help CYP SODA – that’s boys and girls who are survivors of domestic abuse.